You can create any helpers within the panel Create > Helpers > Exlevel. 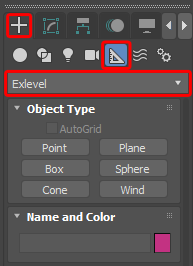 On the Create panel, click Helpers, choose Exlevel from the list and then click Point, Plane, Box, Sphere, Cone or Wind. Drag in a viewport to set the center and size of the helper object.